This is a really interesting, comfortable and well equipped house with a great roof terrace. It's within easy walking distance of lots of bars and restaurants but when you go into the house and close the door it's quiet and peaceful. We had a very enjoyable stay here and look forward to returning. Thanks a lot Gaynor. Yo are always welcome. We've stayed at this property with our two kids (5 and 9) twice now and have loved both experiences. Mario and Sofia are both very friendly and welcoming, and always happy to help in any way they can. The house is really well located, a short stroll to the heart of Vejer, not far from the local 'big' supermarket (Supersol) and it's fairly easy to find a parking space nearby – even during Feria! It's also a real 'home from home' with comfort and style in equal measure – the perfect place to relax and unwind at the end of the day. The kitchen is well equipped with everything you should need and both bathrooms have very good showers. We also very much appreciated the stash of beach toys, deckchairs and parasols that we were able to borrow for our many trips to the beach. The 'piece de resistance' has to be the roof terrace though, with its spectacular views over the old town – not forgetting the added boon of having a hammock! It's a great place to soak up the buzzing atmosphere of this fantastic white village of an evening. We'd highly recommend this property. Many thanks family for your words. It is a pleasure to have people like you in our house. We always try to make the guests feel at home, and it makes us happy to prove that we got it. A thousand thanks for your visit. If you decide to return to this beautiful town, here we will be waiting to welcome you in our house. We wish you a happy summer. Great house with enormous roof terrace giving lovely views over the old town. The house feels very much like a home and has everything you need to feel comfortable. Many of these traditional homes have spiral staircases or very steep stairs up to their terraces, but this house has a good, broad staircase which makes it much easier to carry up breakfast trays in the morning (or the odd glass of vino in the evening!). Mario was lovely and the arrangements to get the keys for the property were very easy. Vejer is a lovely town, and a real delight for foodies- you could stay here for a month and not eat at every place you wanted to try. We hope to come back sometime and would definitely hope to stay at Mario & Sofia's home again. We are happy to welcome guests like lesley. It is a pleasure to meet people kind, respectful, cordial and careful with the house. We put a lot of love so that our guests feel very comfortable in the house and we try to help in everything that they ask us. Thank you Lesley for letting us know you, even if it was only a few days. You will always be well received. We had an excellent stay in this beautiful townhouse in Vejer. The house is in the middle of town, it has large rooms, a beautiful roof terasse, whose view over the town we already miss, the kitchen well equipped and big, and the rooms are furnished tastefully and with style. Mario is an excelent host, very helpful and with a lot of tips and recoomendations for activities. HELLO FAMILY!! Thank you very much for your comment. We are very happy that your stay in our house has been relaxed and pleasant. It was a pleasure to meet you and have you in our home. It will be a pleasure to welcome you again in our house. For whatever you want, we will be here to help you in your holidays or whatever you want. A warm hug to each of you. A beautifully appointed home from home in the heart of Vejer de la Frontera, the idyllic town on the the Costa de la Luz. This is no basic holiday rental, but a home filled with creature comforts which instantly make you feel relaxed and at ease. Mario and Sofia, the owners of the apartment, are always on hand if you need anything. With so many bars and restaurants on your doorstep, and the coasts only 20 minutes away by car, this is the perfect location for a truly memorable holiday. Magnifique appartement, décoration « voyage » très croquignolette. L’hôte, Mario, est très serviable et accueillant ... l’appartement est tout à fait pratique pour les petits enfants (gare aux marches toutefois). Tout est pratique et bien pensé: l’appartement est bien équipé... 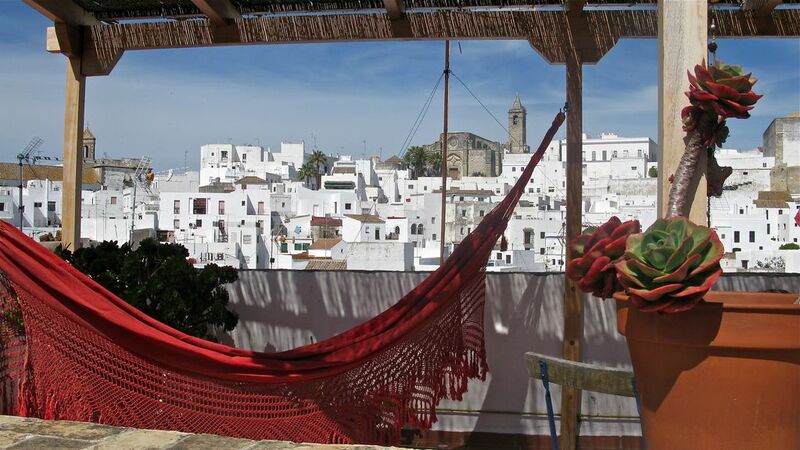 Le rooftop offre une vue dont on ne se lasse pas sur le village blanc de Vejer! Bref un vrai coup de cœur pour ceux qui cherchent un petit endroit hors du temps en Andalousie. Seul bémol : peu d’acivites À faire avec des enfants en bas âge dans les environs, à part la plage. Problème aussi si beaucoup de vent, d’est, car la plage n’est alors plus praticable... un Séjour de 7 jours est donc peut être un peu trop long si vous voyagez avec petits enfants ... bon voyage ! El deposito de seguridad es de 150€ que se entregara al recibir las llaves .Se hará la devolución de esta fianza depósito( si no hay desperfectos en la casa) a la recogida de las llaves después del periodo de estancia.